The JP’s Exe to Axe is a grade B fell race and has been described by Runners World as a brute of a race with outstanding views. The route follows the Coastal Path and offers the runners a little under twenty two miles of the beautiful Jurassic Coastline an AONB. It is needless to say a very tough route with approximately 3800 ft of elevation gain. Planning the 17th annual Exe to Axe has been in progress for 12 months and was led by David Lee the Race Director, with Rob Edwards as Race Officer and past Race Director, Paul Mitchell. This year as in previous years, Race HQ was at the Exmouth Life Saving Club and was opened at 08:00 in readiness for the early runners. Two seventy seat coaches arrived early, having transporting runners from Seaton the finish, to the start line at Foxes Hole Car Park in Exmouth. The seafront was buzzing with excitement as the runners prepared for the big race. Rob and Sue Edwards (time keepers) arranged the race number issue, accompanied by several members of his family including young Stanley, Belinda and Katy. Julie Mitchell and Ashlyn Lee processed the runners before going on to Seaton to prepare for the end of the race. JP’s Exe to Axe has a 6 hour completion time, so to help slower runners an early start is offered and 25 runners took advantage of this option. Time keeper Colin Flood, who has undertaken this important role has performed this duty for the club for many years. Dual recorders are used and are calibrated before the event. 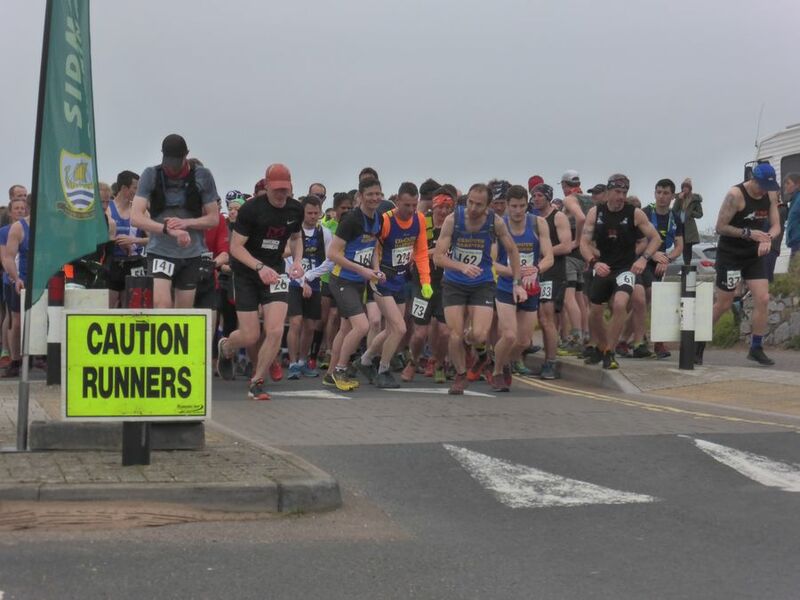 Three hundred and twenty five runners registered for the race this year, with some sensibly opting for a race deferral due to late injuries. Hamish Spence, SRC Press Officer reported and Kyle Baker photographed the preparations and then set off around the course with Head Marshall and referee Tim Clay with our First Aid responder provided by Rapid Emergency Medical services. 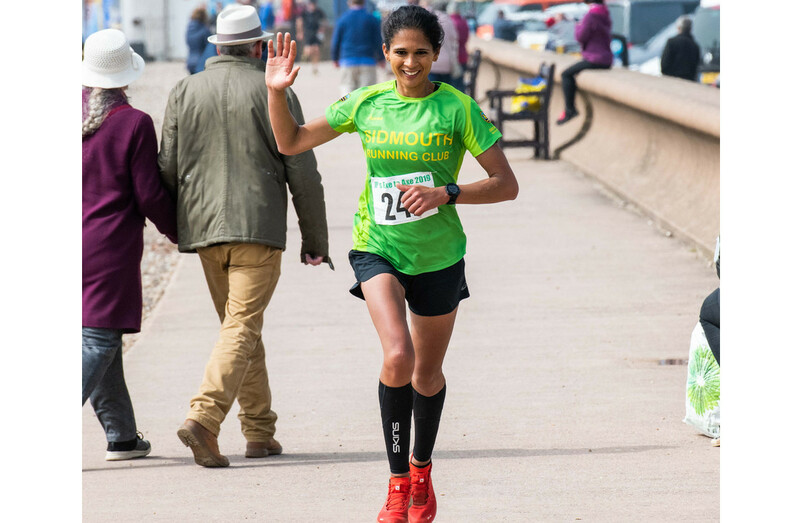 The race starts at Foxes Hole carpark on the seafront of Exmouth and heads to Budleigh Salterton. This section is the flattest and can lull the competitors into a false sense of ease. Section two takes a turn inland for a tour along the River Otter estuary and then on along the coastal path to Sidmouth Sailing Club. This is the halfway point and the runners can stock up on provisions. The relay teams do their hand overs at this point. Section three is the toughest, throwing the runners into a long steep hill immediately with plenty more to follow all the way to Branscombe Mouth. The last section goes through the village of Beer and finishes along the Seaton Promenade at the Axe Valley Sailing Club. The first small group (25 early starters), including Mighty Green Jennifer Bentley who continues to raise funds for HCPT group, were all sent on their way at 09:00. This group has an extra hour, 7hours in total in which to reach Seaton. The second race started promptly at 10am with those going half way, those doing the relay and the full Exe/Axe race. With good running conditions, grey skies, dryish under foot and a head wind. all 244 competitors got on their way along the seafront to the zig-zag (bottle neck) narrow slope. Those that wanted good time-keeping sprinted to that point. Kirsteen Welch pretty much led the ladies the whole way, with a short spell as 2nd lady leading between Budleigh and Sidmouth. She picked up the pace coming down peak hill into Sidmouth, taking the lead back from then and gaining distance on every mile. She also overtook 5 men in the last 6 miles and was beaming from ear to ear as she flew through Branscombe. In fact she by all accounts smiled the whole way around. The hilly training runs she does seem to have paid off as she remained strong throughout. This is the longest race Kirsteen has competed to date and also the 1st race since she tore her hamstring tendon 9 weeks ago. She wasn’t sure how her hamstring would hold out, so to do that well in such a tough race shows that Kirsteen is back and on track. Kirsteen now holds the Exe Axe record breaking time for the ladies, knocking 8 minutes from Anna Bartlett the previous holder from Mercia Fell Runners. A massive well done to her. Not far behind Kirsteen and running with her for the first half of the race was Mark Soutar. The Exe to Axe has been his bogey race and he has yet to have one go smoothly. This time, just three miles in and a calf muscle tear turned the race to a Jurassic journey back in time! He said “Having started in Exmouth in an upright posture akin to Homo Sapien, that by the time I arrived in Seaton, I was slumped, lolloping along and communicating with grunts like primitive man”! He found it harder than the Grizzly! Jim Forrer and Jessica Raynor were just a few minutes behind Mark. Both Jim and Jessica looked like they had their stride and were in the zone. Jess and Nicola Dowsing both ran this tough course and it was the last of 4 runs they did in an effort to raise money for a friends little girl. Previously taking part in the Blackdown Beast, The 4 Trigs, The Grizzly and now the Exe to Axe. Betsy, the young girl was diagnosed with a brain tumour when she was two and a half and has lost her sight. We are raising money for future treatments to try and improve her vision. Charlotte Forrer and Jess Trim ran the route together along with a half eaten banana holding Simon Hollyer, with whom a game of cat and mouse was being played out. Pre-race nerves is something that Simon Hollyer has not suffered before as he describes his race running style as a plod. He has never been in contention for a medal and consequently not been remotely anxious before a race. However, this time he was nervous. For the past couple of months, his training runs have got longer and his calves have started to cramp at around 18 miles. Also he finally retired his old trail shoes after the Grizzly, as the heel had worn away along with a part of the sole below. The new shoes came 2 weeks before the race, so plenty of time to wear them in. However, he hated them! The first run left a hole in the top of a toe and very sore instep. With strategically placed plasters he headed for the second run to find that the shoes bit into his heel and I could barely walk at the end. Having cost a small fortune and with some perseverance they were worn on a couple of shorter runs. Everything felt fine, but they had done on earlier runs for the first few miles! Simon contemplated using his road shoes but with the recent rain was worried that the trails may be too muddy. So reluctantly chose to wear the hated new shoes! Hence the nerves. Simon started the race still holding a half eaten pre-race banana as he couldn’t face finishing it. Having not gone far, in fact only to the top of the zig-zag ramp at Exmouth he had to stop and check inside one shoe. A £1 coin was retrieved and placed in a pocket for later. Whilst messing around with the shoe Rocker Shepperd, Charlotte, Jess and Nicola all overtook him. 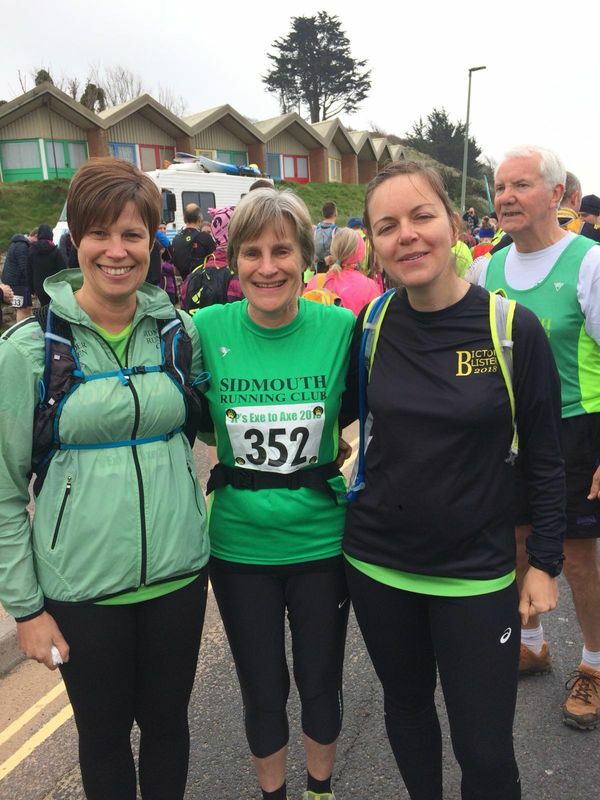 Rocker didn’t take much catching up as he was recovering from an injury and was finishing at Sidmouth. They ran together for a while, high-fived Tim at Sandy Bay who was standing like a mannequin with his arm out giving directions. Simon still had the half eaten banana in his hand at Budleigh, which was rapidly turning black, The first half of the race to Sidmouth went well and he was able to climb a lot of the hills without his heart racing, but coming down Peak Hill the vague shape of the hills in front shrouded in mist looked ominous. Knowledge of the area is sometimes not an advantage, especially when you know how tough that actual hill is. On reaching Salcombe Hill the sun had made a welcome appearance and half way up were Kyle and Martin waiting for photo opportunities. They demanded that Simon stops walking and to sprint up the hill instead. This was so they could capture the moment for posterity. This order was met with Simon stopping as soon as he had passed them. Simon asked Martin for the lead of his dog in the hope it would pull him up the hill. He wasn’t having any of it! At the frog stone was nemesis Charlotte with Jess and Nicola. Simon felt it wise to give them a wide berth as he passed, for fear of feeling a hand in my back sending me sprawling. A little later on when descending down towards Weston, someone shouted out that he’d gone the wrong way, followed by gleeful laugher as Charlotte & friends passed him by. He smiled to himself when he saw them take the longer path into Branscombe. He had them….he thought. With spirits raised all the way through, helped on by the friendly reception from the Marshalls, Simon had his sights firmly on finishing. He particularly enjoyed the very enthusiastic welcome at the Branscombe water stop. Daring not to look more than a few feet in front of himself, Simon made it all the way up the Branscombe Hill steps. The last time he did this each step felt like it was double the height it needed to be and came close to giving up. It wasn’t as bad as remembered and so he looked around for the view. Trouble had almost arrived, Charlotte & co had almost reached the top. Thinking that he was in better shape at this point than a previous race and still no calf twinges he thought he wasn’t to be caught. However, when he reached Beer Head the three ladies breezed past him chatting as though it was an easy Sunday social run. They pulled further away going out of Beer and looked like that was that! When cresting the last hill, the three ladies were back in view. They weren’t as far ahead as thought, but it was going to be difficult catching them. On reaching the Hideaway Café, the race was back on. However, the timing for the sprint finish would have to be good. Nicola took off after another runner, so she was uncatchable. He waited just a bit longer and then started the sprint, he really pushed himself but it was not to be, they beat Simon by seconds! All three, Charlotte, Jess and Simon finished with just seconds between them. This was a first attempt at JP’s Exe Axe race for Colin I’Anson. Colin had told his wife he would be four and a half hours and amazingly he was right. Crystal balls do work then, or perhaps like me, you just know how long you will be when you give a time to your better half. He had a good race, but found himself unprepared when he got to Weston Mouth as all the fresh relay runners descended upon him. Not far behind Colin was Lynda Hawkins sweeping up the SRC runners. In the half route Cathy Keast got off to a flying start, literally! 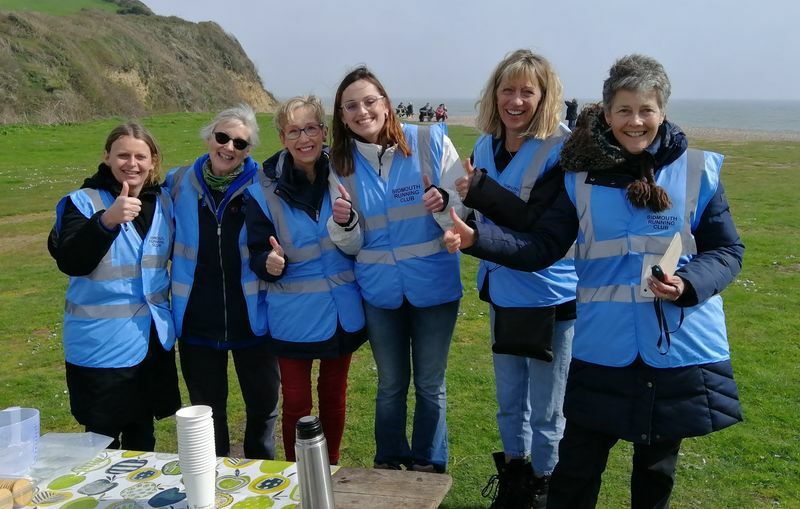 Having thrown herself onto shingle not long after setting off and making a right mess of the stones, she picked herself up, got patched up and was off again with her fellow Mighty Green Ladies, Helen Palmer and Els Laureys. Kat and Antony Hall (SRC Team Hall) with Kat doing the first half and Antony doing the second they came in 5th place in 3h56m33s. Auther and Christine Vince (Sidmouth Ancient and Dazed ) Although they completed the route, they unfortunately they missed the shut off time. There were 13 teams. The event was officially closed at 16:00 however the last runner did not finish until 16:30 . The last runner, Back Marker and Marshall Danny Painter, one of the quickest runners in the club undertakes this job every year. It is a difficult task, as he needs to ensure all runners are accounted for who may stop around the course and to keep motivating the last competitors to make it to the end. Paula Farrand and daughter Amelie were in charge of awarding medals to the winners supported by Ashlynn Lee and Julie Mitchell who were issuing snacks and drink. 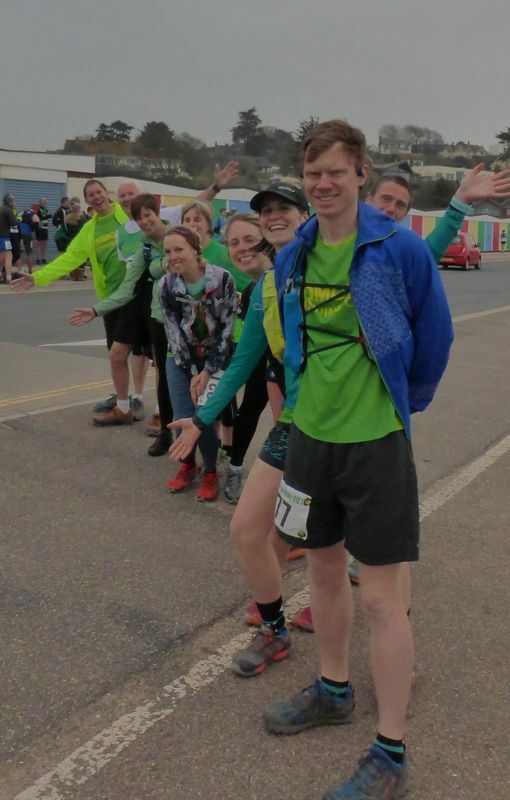 Colin Flood and Alexa Baker who transported the runners baggage from Exmouth to Seaton also timed and registered all returning runners as they arrived. They did a fantastic job with a constant stream of runners for three and half hours. A really well organised race and awesome support from all the Marshall’s and other mighty green members. Results, full distance 6h cut off: Record breaker Kirsteen Welch 1st SRC, 1st Lady past the post in 3h:07m:56s – Mark Souter 70th 3h:47m:45s – Jim Forrer 75th 3h:50m:22s – Jessica Raynor 79th 3h:52m:45s – Nicola Dowsing 144th 4h:24m:45s – Charlotte Forrer 146th 4h:25m:05s – Jess Trim 147th 4h:25m:09s – Simon Hollyer 148th 4h:25m:14s – Colin I’Anson 159th 4h:30m:45s – Lynda Hawkins 181st 4h:46m:13s. Full distance, early start: Jenifer Bentley 224th 5h:36m:23s.